Gurgaon, India, October 12, 2016: Today, Nagarro, a specialist provider of software development and management services, and Upskill (Formerly APX Labs), developer of the Skylight platform which powers the connected workforce, announced a partnership to deliver wearable technology solutions to enterprises worldwide. By joining forces, Nagarro and Upskill (Formerly APX Labs) will be well positioned to offer large, global customers transformative applications of smart glasses and other wearable devices to help upskill hands-on workers and drive dramatic operational improvements in quality, efficiency, safety, and other key value drivers. With this mutually beneficial partnership, Nagarro and Upskill (Formerly APX Labs) will work closely to engage with global customers across a range of industries including Aerospace, Industrial Manufacturing, Electronics, Medical Equipment and Transportation. Using the Skylight platform, the two companies will deliver innovative wearable solutions to support a variety of use cases in manufacturing and supply chain management, maintenance and repair operations, and logistics. “With this partnership, we will jointly concentrate on our assisted reality initiative, as it promises the most obvious benefits of a ‘connected workforce’ across various industries,” said Michel Dorochevsky, CTO at Nagarro. “This initiative will enable us to bring a lot of innovation to our customers”. 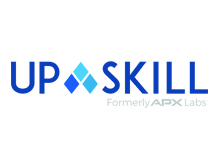 Upskill (Formerly APX Labs) is an enterprise software company that powers the connected workforce. The company’s Skylight software platform runs on smart glasses and other wearable devices to upskill hands-on workers across manufacturing, field services and logistics. World-class companies such as Boeing, GE, Rio Tinto, Jabil, Merck, Shell, Johnson & Johnson, and Westinghouse use Skylight to increase productivity, quality, operational efficiency, workforce utilization and uptime. Upskill (Formerly APX Labs) is recognized as a Technology Pioneer by the World Economic Forum and by Frost and Sullivan as a recipient of its Customer Value Excellence award. For additional information, visit https://upskill.io/. Nagarro provides technology services for digital disruption to both industry leaders and challengers. When our clients want to move fast and make things, they turn to us. We combine design, digital and data to help them outperform the competition. We distinguish ourselves by our agility, imagination and absolute commitment to our clients’ business success. Some of our clients include Siemens, GE, Lufthansa, Viacom, Estēe Lauder, ASSA ABLOY, Ericsson, DHL, Mitsubishi, BMW, the City of New York, Erste Bank, T-Systems, SAP and Infor. Working with these clients, we continually push at the boundaries of what is possible to do through technology, and in what time frame. Today we are more than 3,500 experts across 12 countries. Together we form Nagarro, the global services division of Munich-based Allgeier SE. To know more visit www.nagarro.com. As a partner to Upskill (Formerly APX Labs), we take our assisted reality initiative forward by delivering innovative wearable solutions to global customers across a range of industries including Aerospace, Industrial Manufacturing, Medical Equipment and more.